Ranthambhore Forest Resorts is the best luxury jungle resort and draws the attention of people from within the country and abroad. The hotel is located the lush green forest border of National Park and expansion over an area of the hotel is 5 acres. Forest resort is the magic charm to an ideal people destination and has good approachability from the nearest all cities. Aravali Mountain in front of hotel provides a unique wildlife backdrop. Wild animals can be seen and heard around the hotel during your stay, unrivaled variety of animals such as herds of the sambar and spotted deer, Jackals, Hyenas and leopards. If you are lucky of course you can see Tiger. The hotel offers excellent in house facilities including restaurant adjoining well-designed lawns, travel desk, wildlife library, swimming pool with separate pool area for children and you can enjoy with game activates like volley ball, badminton and tennis on perfectly set courts. It is a great place to stay at Ranthambore. 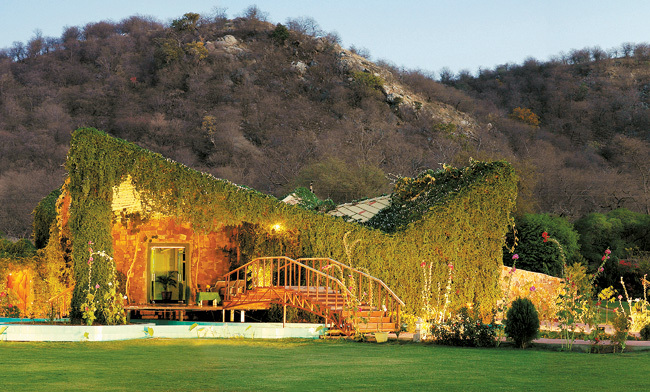 Ranthambhore Forest Resort offers 46 luxury air conditioned cottages with Verandas. All cottages are dividing into groups, with each group being a conspicuous category. There are small grassplot in front of every cottage group with chair set up. All cottages are well equipped with all luxurious amenities for example LCD TV, mini bar, study desk, tea and coffee maker, king size bed , attached bathroom with 24 hours hot and cold running water and large window overlook the resort. Major parts of cottages are wrapped by creepers and climbers flowering plants. The entire circle area of resort is a ideal point in the evening for tea and coffee with beautiful camp fire. In the evening time you can enjoy with traditional dance and song performed by local artist at the Resort circle area. The traditional music is charming and enhances the blossom of the wild environment. The Resort offers multi cousin restaurant and Centralized dining hall with Indian, continental and Chinese recopies. Ranthambore Forest Resort is the best place for relax and explore wildlife in national Park. You will feel completely like home during your stay. 46 Luxury Air Conditioned Double Bedrooms with Verandas. Conference and Banquet Hall to accommodate 80 persons. Three elegant lawns suitable for get-togethers. Attached luxurious bathroom with bathtub.